It's 1962 and all across America barriers are collapsing. But when Natalie Marx's mother inquires about summer accommodations in Vermont, she gets the following reply: The Inn at Lake Devine is a family-owned resort, which has been in continuous operation since 1922. Our guests who feel most comfortable here, and return year after year, are Gentiles. For twelve-year-old Natalie, who has a stubborn sense of justice, the words are not a rebuff but an infuriating, irresistible challenge. Elinor Lipman is the author of seven books: the novels The Pursuit of Alice Thrift, The Dearly Departed, The Ladies' Man, The Inn at Lake Devine, Isabel's Bed, The Way Men Act, Then She Found Me, and a collection of stories, Into Love and Out Again. She has been called "the diva of dialogue" (People) and "the last urbane romantic" (Chicago Tribune). Book Magazine said of The Pursuit of Alice Thrift, "Like Jane Austen, the past master of the genre, Lipman isn't only out for laughs. She serves up social satire, too, that's all the more trenchant for being deftly drawn." Her essays have appeared in the Boston Globe Magazine, Gourmet, Chicago Tribune, and The New York Times’ Writers on Writing series. She received the New England Booksellers' 2001 fiction award for a body of work. It was not complicated, and, as my mother pointed out, not even personal: They had a hotel; they didn't want Jews; we were Jews. We were nothing to them, a name on an envelope, when it began in 1962 as a response to a blind inquiry my mother had sent out in multiples. We'd been to Cape Cod and Cape Ann, to Old Orchard, Salisbury, and Hampton beaches, to Winnipesaukee and the Finger Lakes. That year she wrote to Vermont, which someone had told her was heaven. She found a lake on the map that was neither too big nor too small, and not too far north. The Vermont Chamber of Commerce listed some twenty accommodations on Lake Devine. She sent the same letter to a dozen cottage colonies and inns inquiring about rates and availability. The others answered with printed rate cards and cordial notes. But one reply was different, typed on textured white stationery below a green pointillist etching of a lakeside hotel. Croquet on the lawn, the Vermont vacation guide had said; rowboats, sundown concerts on Saturday nights; a lifeguard, a dock, a raft, a slide. The Inn's letter said, "Dear Mrs. Marx: Thank you for your inquiry. Our two-bedroom cabins rent at the weekly rate of sixty-five (U.S.) dollars. We do have a few openings during the period you requested. 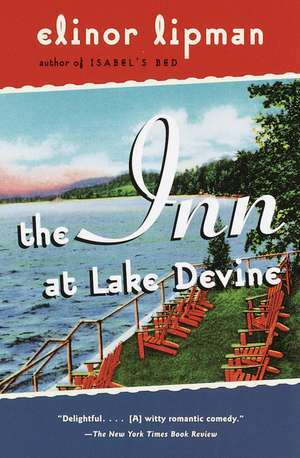 The Inn at Lake Devine is a family-owned resort, which has been in continuous operation since 1922. Our guests who feel most comfortable here, and return year after year, are Gentiles. Very truly yours, (Mrs.) Ingrid Berry, Reservations Manager." I hadn't known up to that moment that I had a surname that was recognizably Jewish, or that people named Marx would be unwelcome somewhere in the United States because of it. I asked if these were Nazis. My mother sighed. I had been wed to the subject since reading, without her permission, The Diary of a Young Girl--specifically obsessed by where we, who had no attic, could hide that would be soundproof, and who among our Gentile acquaintances would bring us food under penalty of death. My mother explained: There were people, unfortunately--for reasons it was hard to explain or understand--who weren't Nazis but didn't like Jews. Not that she wanted me to worry, because this was America, not Germany, not Amsterdam. We were safe here, remember? The letter was ignorant, and very bad manners. Someone should give this Mrs. Berry a piece of their mind. I said, "Can we go?" "You don't go where you're not wanted," my mother said. "Anyone who could write such a letter doesn't deserve our business." She took it back and stuffed it in its envelope with no particular archival care. Two days later, I removed it from the dining-room sideboard to a safer place--my sweater drawer. It fascinated me, the letter's marriage of good manners and anti-Semitism. Why bother to answer Jews at all if you don't want them at your hotel? I tried to picture this Ingrid Berry who had signed neatly in blue ballpoint--the nerve of her insincere "Very truly yours." Was she old? Young? Married? Was Ingrid a German name? Did she get pleasure from insulting the people she banned from her hotel? And why didn't my parents respond to this slap in the face? "If you paid us a million dollars, we wouldn't come to your stupid hotel," I thought we should say. "If you had a baseball team, would you tell Sandy Koufax he couldn't pitch for you? Would you let Danny Kaye rent a room? Tony Curtis? Albert Einstein? Milton Berle? Jesus Christ?" My mother didn't show the letter to my father, because she knew that he, like me, would want to jump in the truck and fix the problem. And so I produced it for him with the same flourish my mother had staged for me. "Good God!" he said, struggling with one hand to put on his reading glasses. I asked him if people who didn't rent rooms to Jews knew about the concentration camps. "Everybody knows by now, honey." I asked if he thought they had seen The Diary of Anne Frank. "Probably not," he said. Then, "You know what I think we should do? Let's write back and tell her we want one of her stupid cabins." I said, "I don't think they have cabins. It looks like a hotel." He embroidered a little drama--not too seriously, but enough to get my mother's goat: We'd go as the Gentiles! Ed and Audrey Gentile. He'd known a man named Gentile in the navy from somewhere like Delaware or Pennsylvania. It was a real name. People truly had that for a name. My mother said, "You'll have to drag me there." "You don't want to see what a place like this is like?" "And lie for the whole time we're there?" "Church," said my mother. "You can bet the whole place empties out to go to church on Sundays." "The Gentile family doesn't go to church when they're on vacation," my father said. "We go regularly on the other fifty weeks, but we pray in the cabin when we're on vacation." "People will know," she said. He thought they wouldn't. He was tall, taller than most Christians I knew, while my mother was a redhead no bigger than Gidget. And his two daughters looked like any two little American girls. "Except," my father said, smiling broadly, "nicer and smarter." "And how would you make your point? Announce as you leave that we were the Eddie Marx family? Jews?" "We wouldn't even have to tell them," said my father. "We could come and go and just know we fooled them." Of course we didn't go. My mother found a place to rent on the opposite shore of Lake Devine--not a resort, but a heated cottage on a dirt road of private camps, listed with the Chamber of Commerce. We went there for two summers and found it, if not heaven, then very nice. The air smelled like bayberry. Indian paintbrush, a wildflower we didn't have at home, dotted every field. We swam and fished from a rowboat without an anchor, caught only ugly black-horned pouts we couldn't eat, and took a day trip to Fort Ticonderoga. The best miniature-golf course I'd ever played was a five-minute car ride away. The local dairy, which offered not only milk but cheddar cheese, made home deliveries even to the summer population. My older sister and I often rowed past the Inn at Lake Devine, and studied it as best we could from offshore. It had a very green lawn, broad and sloping to the water, a white flagpole, and a chalky string of buoys marking off its swimming area. Closer to us, a raft covered with teenagers floated on shiny black oil drums. My sister and I had only each other for company, and a dock with no wading area, but here there were kids our age from what had to be a dozen families, swimming and diving as well as if they were on teams. The following winter, having studied it and envied its postcard perfection, I put a long-thought-out plan into effect as a thirteenth-birthday present to myself. With a deerskin purse full of coins, I went to a pay phone. I called the Inn at Lake Devine and asked for Mrs. Berry. Amazingly, the party said, "This is she." I read from my notes: "I was wondering if you had a cottage available for the entire month of July?" "With whom am I speaking?" she asked. "Miss Edgerly," I said, having elected the name of a Massachusetts man recently tried for murdering his wife in a particularly hideous fashion. Mrs. Berry asked the caller's age, and I said fifteen; yes, I knew I was young to be making inquiries about accommodations, but my mother was recently deceased and my father was spending long hours in court. She said, "We do have two lovely cottages with sleeping porches." "Are they really, really nice?" I asked. "They're in great demand," she said. "Electric stove, baseboard heat, stall shower, picnic table--"
"Is it private? Because my father's kind of famous. He really needs an escape." "We're quiet and peaceful here," said the Berry woman. "It's a perfect hideaway vacation." "Can you save it for us?" "Do you want to inquire about our rates first?" I told her that my father, Mr. Edgerly, had instructed me to get the best accommodations available no matter what the cost. "We require a deposit," said Mrs. Berry. "Do you have a pencil?" I took my time, pretending to record every syllable. "My father will send you a cashier's check first thing tomorrow," I said, adopting the disbursement method repeated daily on The Millionaire. "You are a very smart young lady," said Mrs. Berry. The next morning on my way to school, I anonymously mailed Mrs. Berry an old Globe clipping, its three-column headline blaring, Edgerly trial enters 6th week; jury sees "gruesome" photos, to make the point vividly to Mrs. Berry that her system "rooms open to any Gentile who dials her number" was unfair. I enclosed another clipping from my archives (Liz and Eddie/say I do's/before Rabbi) "this one from Photoplay" which spoke respectfully, even warmly, about Liz Taylor's conversion. The wedding shot showed them under a chupa, the new Mrs. Fisher in a flowered headband and Eddie in a somber dark suit and white satin yarmulke. Honored guests included their best friends, famous and beautiful Hollywood Jews. In 1964, I would send Mrs. Berry a copy of the new Civil Rights Act. I wrote, "U.S. House of Representatives, Washington, D.C.," in the upper-left-hand corner of the envelope, and typed a letter that said, "Dear Hotel Owners, It isn't only Colored people who are helped by this law. Jewish people and others you have excluded in the recent past must now be welcome at your accommodations. It is the Law of the Land." Who knew if I'd ever exchange another letter with a documented anti-Semite? Just in case no one ever insulted me again--in this land of religious freedom and ironclad civil rights--I employed the big gun I was saving for future transgressors: "P.S.,-- I typed and underlined: "In spite of everything I still believe that people are really good at heart."